With Christmas less than a week away and those last-minute presents finally wrapped and put under the tree, it’s the perfect time to give yourself a merry manicure. For those who aren’t quite brave enough to rock a Christmas jumper or some fantastically garish musical earrings, why not add some festivity to your fingernails? If you are unable to book a cheeky Christmas makeover before the big day, do not fear, as nailing the decorative designs has never been so easy! 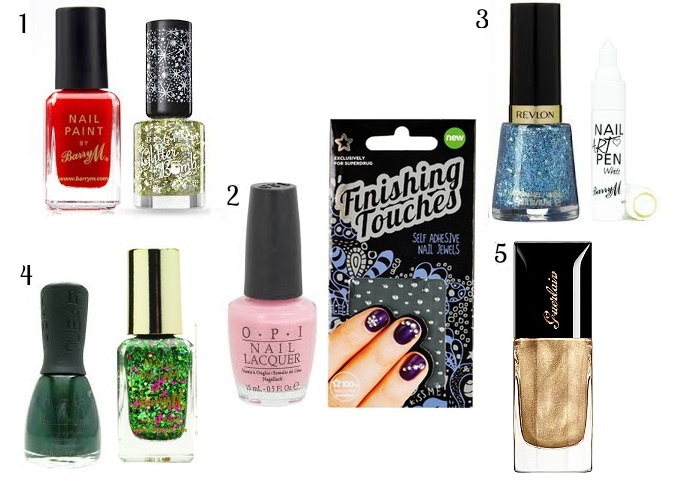 Check out the top five nail polishes that are perfect for the most wonderful time of the year. The ultimate Christmas nail choice has to be a rich Father Christmas red with a dash of sparkle. Whether you decide to go for a red glitter or add some extra sparkle with a gold overlay or shimmering tips, it’s certain to make the simplest of outfits festive. For the snow queen in all of us, a pale pink shade dotted with sparkling nail gems is a simple yet feminine Christmas manicure that looks incredible on stiletto nails. Layer up the pink for a strong but sweet colour, wait for it to dry, then simply apply the self-adhesive gems for a manicure fit for royalty. There are so many different tools available on the high street, so all you need for creating some cool nail art is patience and a steady hand! This glittering blue from Revlon is the perfect setting for a snow-inspired design; four coatings are needed with glittery lacquers to ensure you have perfect pigment. Once the polish has dried, use the Barry M pen to create whatever snow-inspired pattern you like – whether it’s a flurry of snowflakes or falling stars, it’s time to get creative! To make your nails look as though they are covered in tinsel and twinkling fairy lights, apply this metallic emerald green by Nubar and top off with Barry M’s superbly named Christmas Tree varnish. The two will create a dazzling effect, with the coloured sequins shining just like baubles on a tree. If you want a more subtle approach, nothing screams Christmas quite like a polish that is as shimmering, smooth and beautiful as liquid gold. This designer hue from Guerlain is a stylish Christmas-inspired lacquer that will have you shining brighter than a star.